We’d love your help. Let us know what’s wrong with this preview of The Book of Forgiving by Desmond Tutu. Tutu's role as the Chair of the Truth and Reconciliation Commission taug Archbishop Desmond Tutu, Nobel Peace Prize winner, Chair of The Elders, and Chair of South Africa’s Truth and Reconciliation Commission, along with his daughter, the Reverend Mpho Tutu, offer a manual on the art of forgiveness—helping us to realize that we are all capable of healing and transformation. To ask other readers questions about The Book of Forgiving, please sign up. Where to buy online ? R It is available on Amazon. Is this a Christianity-centered book? Would it be worthwhile for an atheist to read? When I first started reading this I confess it was a hard read. So much pain at levels I have never experienced. It made me feel small and fragile to even think of whining about my own troubles when these people really know what it is to experience trauma. Then I learned through the way Mpho and Desmond Tutu explained it that the un-forgivable in my own life was holding me back from being the person I know I can be. I look at these things differently and slowly have become lighter, and feel more When I first started reading this I confess it was a hard read. So much pain at levels I have never experienced. It made me feel small and fragile to even think of whining about my own troubles when these people really know what it is to experience trauma. Then I learned through the way Mpho and Desmond Tutu explained it that the un-forgivable in my own life was holding me back from being the person I know I can be. I look at these things differently and slowly have become lighter, and feel more ease. I'm sold on not letting these things run my life any more. It's not easy, but I'm moving on. Thank you! Note: I got the galleys of the book before publication as I am doing some work with a project called the Forgiveness Challenge. Archbishop Desmond Tutu will be the first to tell you that forgiveness is not for sissies. As the chairman of South Africa's Truth and Reconciliation Commission, he spearheaded the landmark effort to heal a country torn asunder by apartheid. A time and space were created to introduce perpetrator to victim - thieves to those they vandalized, torturers to those they injured, kidnappers to the kin of those they abducted, killers to the families of the slain - so that witness could be borne and quest Archbishop Desmond Tutu will be the first to tell you that forgiveness is not for sissies. As the chairman of South Africa's Truth and Reconciliation Commission, he spearheaded the landmark effort to heal a country torn asunder by apartheid. A time and space were created to introduce perpetrator to victim - thieves to those they vandalized, torturers to those they injured, kidnappers to the kin of those they abducted, killers to the families of the slain - so that witness could be borne and questions answered; treachery confessed, suffering relayed. It was a chance not only to confront the agent of the evil befallen, but to locate the human being behind the sin and, through his humanity, hold him accountable. And if that's not the way you thought I was going to finish that sentence, you might want to pick up a copy of this book. Because it's not about letting people off the hook. It's about acknowledging the damage done, laying the outrage at the foot of the one who delivered it, and finding the means to get on with the rest of your life. But let's bring this a little closer to home, because what is true of those who have suffered grievous loss and catastrophic injury is also true of those who have been broken in thoughtless, selfish, everyday ways. Harm is harm, and what sets the heart to bleeding or the soul to ache is as much in need of address as anything prosecutable in a court of law. There are wounds we own that have not closed; hurts we carry like luggage through the years that leave us stumbling beneath their weight. If you've ever been told, "You have to let this go," well, we both know you were talking to a well-intentioned idiot. If you could have let this go you would have let this go a long, long time ago. Turning away is hardly the answer. Turning toward, though. Whoa. That's an awful lot of pain. You'd be hard-pressed to find a better guide through this particularly brutal morass than Archbishop Desmond Tutu. He's been there. He's done that. Here's the guy with the compass. A truly restorative book filled with fantastic spiritual exercises and examples. This is not an entertaining read, it is work. Not the prose, but the subject matter. Yet, if you read it through you can't help but feel better and see the world differently. Until I read this book, the idea of forgiveness was rather vague and obscure--something that as a Christian I knew I was "supposed" to do, but I really had no idea how to go about it. How did I know if I had truly forgiven? I always had the impression that I had forgiven when I was no longer angry. But how could I stop being angry? Well I guess I needed to do a better job at forgiving because if I was still having flashes of anger, clearly I had not "completely" forgiven. Needless to say, the top Until I read this book, the idea of forgiveness was rather vague and obscure--something that as a Christian I knew I was "supposed" to do, but I really had no idea how to go about it. How did I know if I had truly forgiven? I always had the impression that I had forgiven when I was no longer angry. But how could I stop being angry? Well I guess I needed to do a better job at forgiving because if I was still having flashes of anger, clearly I had not "completely" forgiven. Needless to say, the topic of forgiveness turned into a vicious cycle, with each round gaining a measure of guilt at each pass--forgiveness-> anger-> guilt. This book finally broke that cycle. Based in scientific reasoning, it provides a clear four-step process for forgiveness. In my Christian upbringing, the steps of "Telling the Story" and "Naming the Hurt" were never identified. I always tried to jump from being hurt right to forgiveness, which is why I was never successful. Important read. I started this book in the aftermath of the Paris terrorist attacks. I seek a world of forgiveness and peace. I believe no one is beyond the reach of forgiveness. "Forgiveness is nothing less than the way we heal the world." "There is also no end to the human capacity for healing. In each of us, there is an innate ability to create joy out of suffering, to find hope in the most hopeless of situations, and to heal any relationship in need of healing." "Forgiveness is simply about und Important read. I started this book in the aftermath of the Paris terrorist attacks. I seek a world of forgiveness and peace. I believe no one is beyond the reach of forgiveness. "Forgiveness is simply about understanding that every one of us is both inherently good and inherently flawed." "Peace is built with every small and large act of forgiveness." "We are not responsible for what breaks us, but we can be responsible for what puts us back together again." "It is this knowledge of my own frailty that helps me find my compassion, my empathy, my similarity, and my forgiveness for the frailty and cruelty of others." "Growth happens through obstacles and only with resistance." "There can be no reconciliation without responsibility." "We feel shame in isolation. It can only be healed in a community and in connection with others." ***UPDATE 3/6/17***. Finished my fifth read. Continues to resonate with me in a multitude of ways. Oprah described this as a "doctorate level education" in the concept of Forgiveness. With a capital F.
This book made me weep. Read it if you need to learn how to forgive, what forgiveness is, what it is not, and why it is absolutely mandatory if you want to live a life of love and connection. The best book on forgiveness that I have ever read. It took me four months to read it. It is one you have to digest slowly and purposefully. <3 I love that I started it in the fall when everything was dying and am finishing it as the hope of spring is right outside my door. I must express my gratitude to Desmond Tutu and Mpho Tutu for writing this book. It has opened my eyes, my heart, my mind to truly understanding forgiveness. It has inspired me to embrace this work and has bolstered my courage to move forward. At first I found it a bit difficult, as it uncovered some deep-seeded pain and trauma. But I am grateful to now have the warm, loving framework this book provides to walk the path of forgiveness. I appreciate the book's holistic thoroughness - understandin I must express my gratitude to Desmond Tutu and Mpho Tutu for writing this book. It has opened my eyes, my heart, my mind to truly understanding forgiveness. It has inspired me to embrace this work and has bolstered my courage to move forward. At first I found it a bit difficult, as it uncovered some deep-seeded pain and trauma. But I am grateful to now have the warm, loving framework this book provides to walk the path of forgiveness. 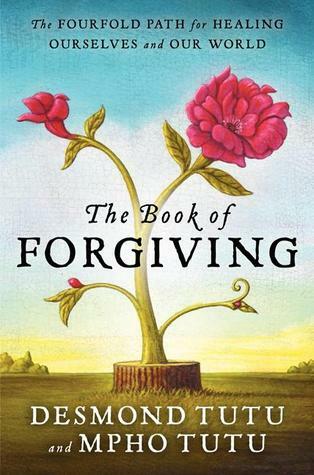 I appreciate the book's holistic thoroughness - understanding what forgiveness is and is not, detailing the fourfold path of forgiveness, honoring when you aren't ready yet, needing and asking for forgiveness and (so important) forgiving yourself. The inspiring stories, meditations and exercises throughout facilitate a deep, comprehensive understanding of the difficult, challenging work of forgiveness. I felt the love the authors genuinely feel for our shared humanity throughout the book. The encouragement and acceptance of wherever you are in your forgiveness journey is authentic. By the end of the book I felt as if I had been blessed to be held by two loving friends who genuinely wish to encourage and support, regardless of where I am on the fourfold path. Truly beautiful book. The instruction for forgiveness is really illustrated well with fabulously shared stories. Both beautiful and very practical. A book I think could benefit and inspire just about anyone and everyone. The weight of its authors' experience transforms what could otherwise have been a regular self-help book into a remarkable guide to personal and collective transformation. Not only does the book offer solid justifications for forgiving others, and personal experiences to back up the justifications, it also includes unique rituals and meditations for readers to try if they're struggling with forgiving others. I learned much from this book. I can’t say enough good things about this book. Regardless of your life story, you need this book. It now occupies a place very near the top of the most influential books I have ever read. I ordered this book for my son after completing the Tutu Forgiveness Challenge on line. (Check out the intro video with his daughter. Delightful!) At first I found it almost simplistically silly. But as I continued to force myself to work the daily challenge, I begin to realize this simple little program was having a defined effect upon and within me. Archbishop Tutu in concert with his daughter, Reverend Mpho Tutu have compiled a successful program reflected within the pages of this little book I ordered this book for my son after completing the Tutu Forgiveness Challenge on line. (Check out the intro video with his daughter. Delightful!) At first I found it almost simplistically silly. But as I continued to force myself to work the daily challenge, I begin to realize this simple little program was having a defined effect upon and within me. Archbishop Tutu in concert with his daughter, Reverend Mpho Tutu have compiled a successful program reflected within the pages of this little book: "a manual on the art of forgiveness—helping us to realize that we are all capable of healing and transformation." The book was born out of the trials of South Africa. Rather than altercations after suspension of apartheid, "this new nation chose to tread the difficult path of confession, forgiveness, and reconciliation." The book takes its reader through four steps of forgiveness toward healing: admitting and acknowledging any wrong or potential harm; telling one's story and witnessing the anguish; asking for and granting forgiveness; renewing or releasing the relationship. Their simplistic method allows the participant --- IF willing --- to look deeply within their psyche, acknowledging their feelings and emotions. At times when journaling what I was feeling, I allowed myself, without judgment, to feel the anger, sadness, joy or happiness I was experiencing. And this little exercise of putting it all down on paper, allowed a tremendous release from these old issues. By the end of the 30 day program, my mental, spiritual and physical health and well-being had undergone a true transformation. For that reason alone I purchased The Book of Forgiving as a gift, hoping my son will choose to release some of the anger bottled within his soul. A pretty comprehensive look at what I’ve come to be convinced is one of the most powerful forces of transformation of both self and others that is in humanity’s toolkit. Most of the stories here are no small-potatoes injustices – we’re talking true, heartbreaking tales of violence, cruelty, negligence, loss, grief, etc. I won’t lie to you – they weren’t always easy to read, but every one of the people who rose above the situation and forgave healed not only themselves but the entire community an A pretty comprehensive look at what I’ve come to be convinced is one of the most powerful forces of transformation of both self and others that is in humanity’s toolkit. Most of the stories here are no small-potatoes injustices – we’re talking true, heartbreaking tales of violence, cruelty, negligence, loss, grief, etc. I won’t lie to you – they weren’t always easy to read, but every one of the people who rose above the situation and forgave healed not only themselves but the entire community and beyond. In short, the scope of redemption equals or even surpasses the grievances, to a staggering degree. The authors do a very good job of clearly stating - and repeating - that forgiveness is NOT condoning, excusing, showing weakness or any other reason that people withhold forgiving themselves or others. The subject of forgiveness is addressed at so many levels – individual, relational, national and even scientific. The path is shown and the steps clearly laid out. There are great exercises that will engage different parts of the mind and heart. I got so much out of it and I hadn’t been seeking forgiveness or to be forgiven in any large way, so if you do – I think this book has the potential to 100% transform your life, to the extent that you’re defined by an unresolved issue. Audiobook – 3 different narrators, including one of the authors. 4 stars for narration. I recommend this as a must-read book for every adult especially those struggling to forgive either oneself or another human being. The authors, Nobel Laureate, Desmond Tutu and his daughter, Mpho Tutu, offer a practical four step process or path for forgiving others as well as ourselves. These four steps include 1) Telling the Story 2) Naming the Hurt 3) Granting Forgiveness 4) Renewing or Releasing the Relationship. The authors recount how the people of South Africa were able to forgive the most I recommend this as a must-read book for every adult especially those struggling to forgive either oneself or another human being. The authors, Nobel Laureate, Desmond Tutu and his daughter, Mpho Tutu, offer a practical four step process or path for forgiving others as well as ourselves. These four steps include 1) Telling the Story 2) Naming the Hurt 3) Granting Forgiveness 4) Renewing or Releasing the Relationship. The authors recount how the people of South Africa were able to forgive the most heinous of wrongs through the Truth and Reconciliation process. Through this process all the people of South Africa were able to find peace for the nation that practiced the horrific practice of apartheid. What forgiveness is...and what it is not; that is the question finally answered in this incredibly insightful and thought provoking book by Desmond and Mpho Tutu. If you have ever felt guilty because forgiveness was taking too long, or could not muster it up at all, this book is for you. If you have ever been the one seeking forgiveness, this book is for you. If you have not been able to forgive yourself, this book is for you. Although written by two people who would be cons Forgiveness? Really? One of the most important books you'll read in this lifetime. If survivors of apartheid can rebuild a country based on the concept that we're all part of the same human family, that any act can be forgiven, and that every person is capable of transformation, then certainly we can reconsider our own views of who is worthy of forgiveness and who isn't. Including ourselves. It was especially meaningful to read this book while horrific acts of violence are being committed all across the country. Fing One of the most important books you'll read in this lifetime. If survivors of apartheid can rebuild a country based on the concept that we're all part of the same human family, that any act can be forgiven, and that every person is capable of transformation, then certainly we can reconsider our own views of who is worthy of forgiveness and who isn't. Including ourselves. It was especially meaningful to read this book while horrific acts of violence are being committed all across the country. Finger-pointing and retaliation will not lead to healing, and it strays from what Jesus calls us to do: Love your neighbor as yourself. This was a beautiful, poetic book about forgiveness. And it was a practical book about the process of forgiveness--how we need to name the story, acknowledge the hurt, grant forgiveness and decide to renew or release the relationship. But it's not a spiritual book, which surprised me a bit. He does reference his Christian faith a few times, but it's mostly universal insights and gripping stories that lead to psychological techniques and personal reflection exercises. Given the current crisis of t This was a beautiful, poetic book about forgiveness. And it was a practical book about the process of forgiveness--how we need to name the story, acknowledge the hurt, grant forgiveness and decide to renew or release the relationship. But it's not a spiritual book, which surprised me a bit. He does reference his Christian faith a few times, but it's mostly universal insights and gripping stories that lead to psychological techniques and personal reflection exercises. The idea and text of the book I actually liked (3 stars) but that the mentioning of "God" and "Religion" is way to much for me. Before I bought the book I checked the blurb and nothing indicated that this book will be a filled with religion. Obviously I should not trust a blurb for the content if it is written by priests. The ideas behind the book and text I really liked. It has as well rituals, meditation practices and diary exercises which I all found rather annoying even though I practice medit The idea and text of the book I actually liked (3 stars) but that the mentioning of "God" and "Religion" is way to much for me. Before I bought the book I checked the blurb and nothing indicated that this book will be a filled with religion. Obviously I should not trust a blurb for the content if it is written by priests. It has as well rituals, meditation practices and diary exercises which I all found rather annoying even though I practice meditation myself. It felt a bit like a religious ceremony rather than anything else. This book is eye-opening and relevant to anyone's life. The Book of Forgiving can help people recognize and name their pain, assist them in seeking or giving forgiveness, and deciding where to go from there. Tutu heavily relies on the idea that nothing is unforgivable, and nobody is unforgivable. Though written by a religious man, non-religious folk can still relate and use his ideas to change their lives. He mentions God and religion on occasion, but he seems to be a sensible person and realize This book is eye-opening and relevant to anyone's life. The Book of Forgiving can help people recognize and name their pain, assist them in seeking or giving forgiveness, and deciding where to go from there. Tutu heavily relies on the idea that nothing is unforgivable, and nobody is unforgivable. Desmond and Mpho Tutu's text is ideal for congregational and community group work on forgiveness, as well as for individual reflection. Spiritual exercises accompany each chapter, inviting readers into the relational, emotional, and spiritual work of forgiving and being forgiven. Recognizing how difficult forgiving and being forgiven can be, the counsel and stories that accompany the exercises show ways to healing and encourage the reader in the journey. Recommended. A peace-cultivating text. A guide to sorting complicated emotions: those we are conscious of, unconscious of, and those too overwhelming to fully articulate. Questions to be reflected on and meditations offered help the reader to heal traumatic relationships. The pearl inside this book is that psychological injury stimulates the same part of the brain activated when a physical injury occurs, so by confronting the same emotions experienced then we can create a different emotional and biological response now. I can see why Brene Brown said this was one of the most important books she's read. Wish I'd had the words for the Fourfold Path two years ago. The language of renewing or releasing a relationship as part of forgiving is so useful. Restoration does not mean going back to the way things were. This idea is worth the cost of the book. Great and inspiring stories of forgiveness. Will be my go-to resource for forgiveness. A book I found by accident in an airport bookstore by an author who is one of my heroes. What a beautiful way in to forgiveness. Reading, journalling exercises, activities to help us anyone along the road to forgiveness. The "how" of forgiveness that has always eluded me. this book was recommended to me, but I wonder if that person read the whole thing. It is very repetitive. Desmond Tutu and his daughter explain why it is so important to forgive. And how you can heal yourself. An indelible novel. A simple message but very important. Desmond Tutu and his daughter shares with their experiences about 4 step towards healing by forgiving. A strong message that is for everybody.